Township municipal offices are located at 720 Brownsville Road, Sinking Spring, PA 19608; phone: 610-678-3393. 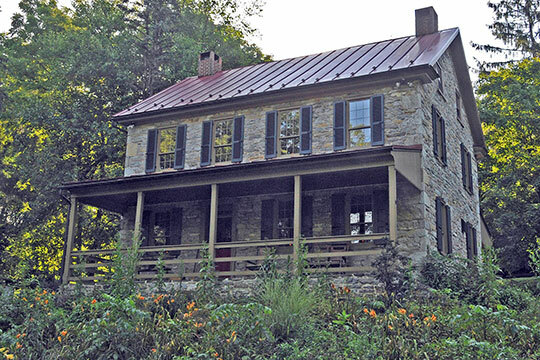 Photo: Millers House, Hain Mill (Wernersville Mill), ca. 1782, Route 495 and Hain Mill Road, Lower Heidelberg Township, Berks County, PA Included in Gristmills in Berks County, PA, nomination document, 1990, National Register of Historic Places. Photographed by user:Jerrye and Roy Klotz, MD, 2008, (own work) [cc-by-4.0 (creativecommons.org/licenses/by-sa/4.0/)], via Wikimedia Commons, accessed July, 2016. Heidelberg Township was reduced in 1842, when Lower Heidelberg was made a separate township. Ten years after the erection of the township a petition was filed for dividing Lower Heidelberg. Commissioners were appointed to draw the line and make a report to court. They reported favorable and suggested Cacoosing as the name of the new district. Objections were filed and the proposed new township was not erected. Small brooks running from South Mountain were made to turn mills. One of the first was built in 1755. There was a paper mill on Spring Creek before 1800. This was later turned into a joiner's shop. Gun barrels next were made here and then it was turned into a woolen factory. The old Berkshire Furnace has historic interest. It was a small charcoal furnace, erected before 1760. The ore was mined in what is now Spring Township. The Reading Furnace was built upon Mill Creek and the Berkshire Furnace was abandoned because of lack of water. A paper mill was started near the mouth of the Cacoosing Creek in 1825, and continued in the Van Reed Family for more than seventy years. It has been operated from time to time by various parties. This township has become famous for its magnificent health resorts. They follow in order of their establishment: Wenrich's Grand View was established in 1849. It has been greatly improved since that time. The Walter Sanitarium has been improved and enlarged several times since it was erected in 1877. It is one of the most noted resorts of its kind in the country. Grosch's Sunset House was built in 1876. It has been much improved and enlarged and is now known as Sunset Hall. Preston's Sunny Side was established in 1880, and operated successfully ever since. It is now Galen Hall. The Hossler Highland House was started by James Schaffer in 1890. It was later bought by James Hossler, who has conducted it successfully ever since.